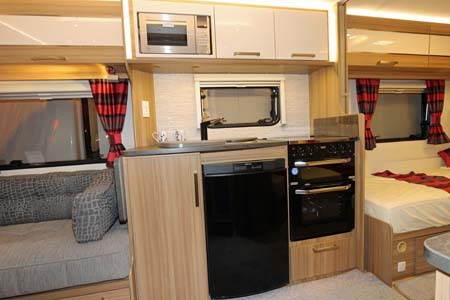 The Lunar Lexon 570 caravan is a new model for 2016 and has the popular fixed-twin-bed layout, with an end washroom, centre kitchen and a living area with parallel seating and chest of drawers. The highlight of the living area has to be the new “Skyview” roof light, measuring 440mm x 1400mm, with LED on its periphery, taking a panoramic view to a new meaning. Add in the over locker lighting and you can change the lighting according to your mood. With parallel seating, a chest of drawers with a pull-out table and a freestanding table the layout is flexible for living, dining and sleeping. The fabrics and wood colour are up-to-date with Montana Oak locker doors with cream gloss panels and the standard upholstery scheme is called Baptiste – bold curtains and scatter cushions complemented by self-patterned grey seat cushions and back rests. Lighting throughout this tourer is LED with new feature cube-like corner wall lights in the living area. The shower room’s décor scheme is white and cream with a charcoal grey feature, hosting the ceiling mounted light in the shower. 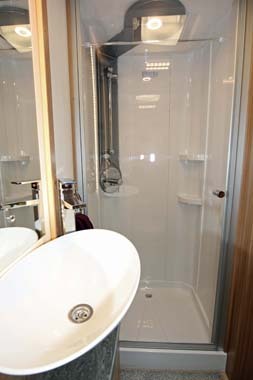 We liked the hinged one-piece door with tiny drain holes on the lower edge, allowing water to run down the door to the drain and straight back into the shower tray. How very practical! The new-style oval top mounted basin, with a back-lit mirror is a contemporary touch and there’s a cupboard under it. There’s also one blown air heating vent for the Truma 6KW ISOTHERM heating system. The twin beds each have a padded headboard, over-bed lockers, shelves over the bed, storage under each bunk, (one side is accessible from the exterior). The wardrobe is at the foot of the nearside bed and has drawers under it. The kitchen is equipped with the Thetford Aspire 2 dual fuel cooker and has a round stainless steel sink with a freestanding drainer and chopping board. Glossy cream overhead lockers and a self-patterned splashback lighten the look, and there’s a worktop extension flap. The fridge sits under the worktop. It’s all very practical and modern. 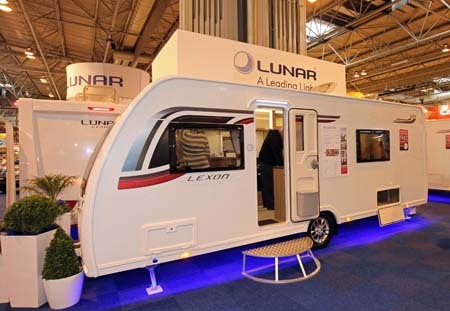 Verdict: The Lunar Lexon 570 has a warm and cosy ambience, with a modern-day air, good use of space and lighting. We suggest that you add optional extra security features like the AL-KO Secure Wheel Lock as this may reflect favourably in the cost to insure this caravan. It’s each to their own. If you have 10 box’s to tick and you tick 8 then it’s a good result for you. You can get whatever layout you want from the enormous range of vans on the market. What makes the difference is your particular preferences and this van ticks most of my box’s. A sensible provision for the TV i.e. not in the front window which is rare for scan with fixed twin beds, decent bed sizes, a weight towable by a large family saloon. Etc. Looks good to me. dont like end toilet .if one goes to bed will be disturbed with anyone using bathroom.also in the night.and would still like manual gas fire .heats up quicker then blown air.have a luner 2 B would have liked a fold down extra small table at side of sink for cooking or a television.and should have a option if you want a oven or extra draw space..what about solar panels and mover allready incorperated. also better securtiy on windows and in side door.if you talk to people who travel on the continent this is one of their concerns as well as a gas alarm.against intruders. Thanks for your comments Pamela. 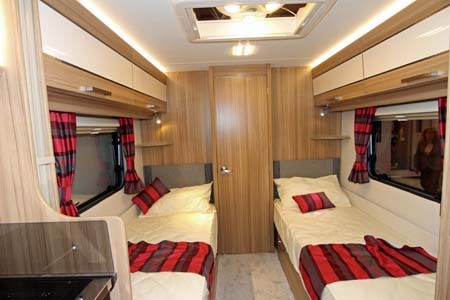 Caravan layout and specification is very much down to personal choice and not everyone will like the same. Models are also often designed to meet popular demand. We have passed your comments on to Lunar Caravans and your concerns about better security and gas alarms will be fed back to their design and development team. 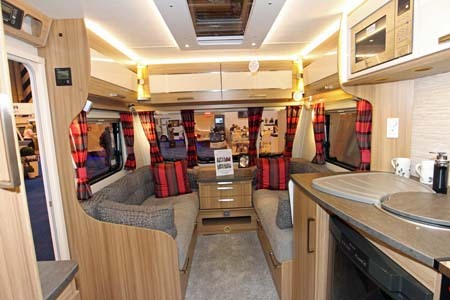 We pick ours up Wed 30th March,can’t wait our dealer is changing our 3 month old Sterling Eccles 530 for a Lunar as we have had more than 30 defects with the sterling. Really like the look of the van and the low weight is great . I would like to add a comment for Lunar. why is the door holder on the outside of the door so short that when the keys are left in after opening the door it dents the side. A longer door holder would do the trick. Also why is the worktop so high, why does the cushions on the settees stop you opening the drawers on the front unit?. Silly points I know but I feel are valid points. Like the change back to flat roller blinds away from the pleated ones that let light in…..
Why 2 single beds and why is the lounge in the front so when eating everyone passing can see what you’re doing? If you want to watch television in bed I guess you need 2 one in lounge one in bedroom not good. Come on Lunar think outside the box lead the design don’t follow like sheep. 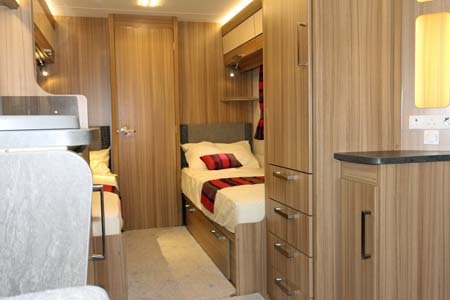 We like the look of this new caravan and will definitely have a look at it.